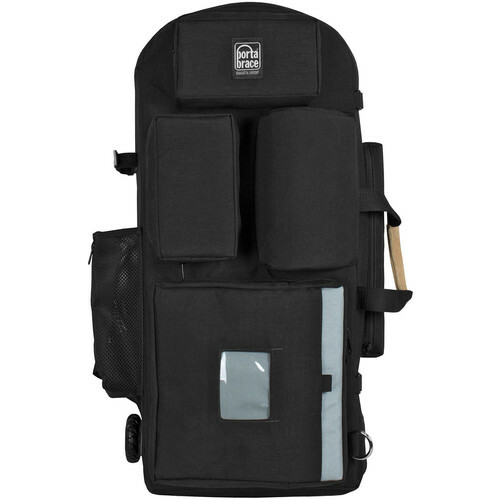 The hiker backpack camera case is designed for comfortably carrying of your camera setups. The case is a backpack with comfortable, adjustable load-bearing straps and a lightweight rigid frame. Or, quickly tuck the backpack straps away and use it as a rolling case or shoulder bag with the included suede shoulder strap. The case is specifically sized to fit common ENG camera configurations. It is constructed using water-resistant 1000D Cordura fabric and water-proofed nylon-bonded triple-tacked stitching for superior water resistance in a range of unpredictable production conditions. The interior lid has an arc-shaped cover for protecting the camera viewfinder. The exterior lid has organizing pockets, including a laptop protective pouch. The inside of the case is lined with Platinum-colored, soft Veltex material. There is a large camera tie-down strap to secure the camera in place during transport. There is also a padded divider system that includes a large rigid, padded divider panel and bendable padded dividers. Box Dimensions (LxWxH) 32.5 x 15.5 x 14.0"